Fallen, or cast out of the third heaven, Lucifer undergoes a name makeover. This former Cherub is renamed Serpent which reflects its deceptive nature. Fallen from Heaven. Cast to Earth. Lucifer has name changed to Serpent. Nachach the Enchanter. Fallen from heaven is the fate reserved for this high-ranking spirit being In Ezekiel 28. In verse 16-17 it is cast to the ground, to Earth. In this first duality context we saw reference to the powerful King of Tyre paralleled by a powerhouse Cherub who was very close to God’s throne until it followed a downward spiral of iniquity into oblivion. In this second scenario in Isaiah 14, we find a similar dual context. The text starts out referring to the king of Babylon and in verse 12 fades in to a detrimental character entitled Lucifer in the King James Bible. Different translations (NIV, God’s Word, Complete Jewish Bible) refer to it as the ‘morning star, son of the dawn’. Lucifer, from the Latin ‘lux’ and ‘fere’ means ‘light bearer/bringer.’ We shall see the implication of ‘bringing light’ when we discuss the first day of creation. Keep in mind what we just read in Ezekiel 28.17 about the Cherub: …you have corrupted your wisdom by reason of your brightness’. 4 That you [Isaiah] shalt take up this proverb against the king of Babylon, [Nebuchadnezar] and say, How has the oppressor ceased! the golden city ceased! 12 How are you fallen from heaven, O Lucifer (H1966 see Further Study below), son of the morning! how are you cut down to the ground, which did weaken the nations! 15 Yet you shalt be brought down to hell, to the sides of the pit. Who was Lucifer and what happened? The inducer of a rebellion the likes of which we have never seen: ‘I will ascend to heaven; I will raise my throne above the stars of God; I will sit enthroned on the mount of assembly, on the utmost heights of the sacred mountain. I will ascend above the tops of the clouds; I will make myself like the Most High’ (vs. 13-14). Imagine the unimaginable, Lucifer imagining, having reached the point where he had convinced itself, it can replace God. The term Lucifer is only used once in the Biblical Hebrew Old Testament in Isaiah 14.12. It is a flashback to bygone times with a rapid–very rapid–explanation of this light-giving Cherub. In fact, there’s more space devoted to his downfall and an enormous amount of space to the new role it plays in God’s plan. This new role is wrapped up in a name. Names change because an individual’s character changes. A key to understanding is: Names define who the individual is who carries a name. In Hebrew it’s much more than just a physical identifier like a social security number. A Biblical Hebrew name tells a lot about who the person really is from a character point of view. KJV – ⨯ certainly, divine, enchanter, (use) ⨯enchantment, learn by experience, ⨯ indeed, diligently observe. Check out the meaning of enchanter: ‘a person who uses magic or sorcery, especially to put someone or something under a spell.’ An individual who manipulates other individuals under their control. If you know the nature of the serpent … even considering his intervention with Adam and Eve. That’s exactly what it did. It’s new names: Serpent, dragon, devil describe it’s character to a tee. The light bringer is now the dark bringer, the total character makeover is clearly visible in its name change. Here is the forerunner of the ‘coup d’état’. This being became ridden with violence and corrupt with power, remember Ezek. 28:16: ‘…you were filled with violence, and you sinned’. No wonder the New Testament tells us that Lucifer, there referred to as the fallen devil, became the father of liars and murderers (John 8:44). It succumbed to negative preferences that it allowed to well up within itself. The magnificently created Lucifer put together a plan to overthrow the one true Creator who sat (and who still sits) on the throne of the spiritual and physical universe. If you are reading this for the first time, I’ll grant you this is hard to believe. This sounds stranger than any story, or science fiction novel you’ve ever read. Yet, it’s right there in your Bible. Galacti is all excited: So, when we bond the two contexts in Ezekiel and Isaiah we see from the ‘fade in’ descriptions that together they’re talking about the same powerful spirit being. The Cherub is Lucifer, Lucifer is the Cherub. It started out wonderfully and, by its own volition, extinguished his bright light into dark obscurity, transforming its wisdom into foolishness, truth into lies, life-helper into murderer. It hit rock bottom, twisted, warped, perverted so much so that it felt it could replace God, its very Creator. Unimaginable… but that’s Bible reality. It became the fallen Serpent. Cinema and electronic games have made interstellar warfare rather routine subjects. Interplanetary conflict is, however, anything but banal. To combat, one must first put together a fighting force. In the somewhat enigmatic chapter 12 of Revelation there is the distinct indication that Lucifer, now referred to as Satan which means ‘Adversary’, (evidence that it had fallen) garnered one-third of the angels to his cause ‘…an enormous red dragon (The great dragon…that ancient serpent called the devil, or Satan, who leads the whole world astray, Rev 12:9)…his tail swept a third of the stars [angels] out of the sky…’ (Rev 12:3-4). On different occasions the devil has and will use this incredible fighting machine to wreak havoc on a heavenly scale ‘And there was war in heaven. Michael and his angels (this is another spirit being and a heavenly army faithful to their Creator God), fought against the dragon, and the dragon and his angels (the third of the stars from verse 4) fought back. But, he was not strong enough, and they lost their place in heaven (Sam: fallen). The great dragon was hurled down…’ (Rev 12:7-9). No created being, no matter how powerful it is, can defeat God, their Creator. However, the unleashed destructive energy of such a confrontation defies the imagination and certainly the penmanship of this author. This warfare, instigated by the Dragon, Lucifer, Satan produced the ‘tohu and bohu’. The names refer to the same fallen spirit being who is the cause and at the origin these scenes of waste and ruin. From glory to degradation–the story of Lucifer. From beauty to devastation–the story of Lucifer’s domain. At UnlockBibleMeaning.com go to Isaiah 14.12 and look at the Biblical Hebrew for Lucifer (1966) and its root 1984. One of the Key to mastering Biblical Hebrew is revealed in H1984-Halal. 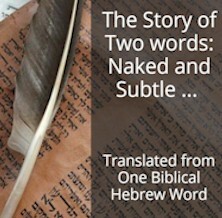 The key that one Biblical Hebrew word describe OPPOSITE CHARACTERISTICS. Here it means shine and boast, celebrate and fool, praise and rage. This is important because it shows the ‘double nature’ that can characterize all beings (human and spiritual) who possess free will. This also explains why beings have the trait of plasticity of mind. This allows intelligent beings to make decisions, change decisions… for better or worse. That is the essence of free will and Biblical Hebrew is the quintessence of this by plasticity with vocabulary that can express BOTH sides of human and spirit nature. There’s no way to see this in a language other than Biblical Hebrew. And frankly, most who refer to Biblical Hebrew don’t understand this key of the plasticity of the language and miss the meaning of the Bible. KJV – (make) boast (self), celebrate, commend, (deal, make), fool(-ish, -ly), glory, give (light), be (make, feign self) mad (against), give in marriage, (sing, be worthy of) praise, rage, renowned, shine. I don’t want to get too deeply into this next point here but in this same verse, Isaiah 14.12, in the exact same context we find the term fallen (H5307) from heaven. Here of course heaven is not referring to the atmosphere (1st heaven), or the sky and outer space (2nd heaven), it is referring to the 3rd heaven where God’s throne resides. The word fallen is, of course, in direct contrast to Lucifer. Look at this in Strong’s and realize that there is a casting down from the 3rd heaven to earth of Lucifer. Understand that this casting down is a result of the casting down of Lucifer’s character.This is where I’ll give you something to think about. Notice that H5307 is also translated die and perish. Now we know that Lucifer can’t die, so then who perishes when they fall? Here’s a clue: Genesis 2.17 But of the tree of the knowledge of good and evil, you shalt not eat of it: for in the day that you eat thereof you shalt surely die. This has a relationship with humans. Think about is. This is part of the story each Biblical Hebrew word tells, another key to mastering this language. KJV – be accepted, cast (down, self, (lots), out), cease, die, divide (by lot), (let) fail, (cause to, let, make, ready to) fall (away, down, -en, -ing), fell(-ing), fugitive, have (inheritance), inferior, be judged (by mistake for H6419 (פָּלַל)), lay (along), (cause to) lie down, light (down), be ([idiom] hast) lost, lying, overthrow, overwhelm, perish, present(-ed, -ing), (make to) rot, slay, smite out, ⨯ surely, throw down. A Cherub is a Very Powerful Spirit Being. Fact or Fiction?